This week I have been doing work experience with the charity ‘Show Racism the Red Card’, it has been extremely interesting learning how the charity works and what it’s all about. I feel like I’ve learnt numerous things across this week working in the office and also across two different schools, one primary school and one secondary. I feel like I know have a greater understanding on racism as a subject and also how different children percept things when it comes to stereotyping and how they feel about racist terminology. Across this week I have had many different challenges; my first one was collecting data out of a questionnaire and noting every different answer that was put down by students in university, the second I had to put my translating skills into use as I translated a survey from English into Welsh which was very challenging yet enjoyable. Both tasks were completed in the office and I also had a lot of fun completing them. The next two days were very different to my first two as I went out to different schools with Noam and Kate on the first and Kris on second. My first day was a school in the Rhondda Cynon Taff area where I observed Noam and Kate do a presentation on what racism actually is, stereotyping and racist terminology. This was very interesting for me as I got to see two different styles of presenting and it was extremely interesting to see how different children react to racial stereotyping as Noam and Kate got to teach them what racism actually is. I could see that the sessions were very successful as I could see the children learning the whole way through without losing interest by playing ‘Culture Shock’ which taught them not to judge someone on their appearance only after you've got to know them and also by clearing the air on the uncertainty about what racist terms are and what words can and can’t be used which was a massive benefit as the majority did not know what terms are okay to use. 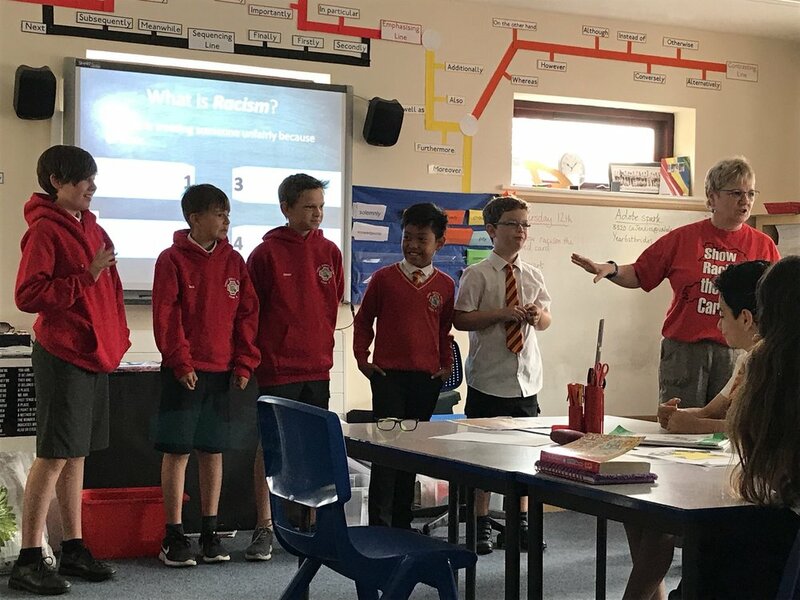 After working in a school with Noam and Kate I then went on to a school in the Vale of Glamorgan with Kris where I enjoyed myself thoroughly throughout the day teaching years 5 and 6 about similar subjects and also learning a few things myself on the way. Kris taught the children and I many different things as her lesson was extremely captivating the whole way through. I believe ‘Show Racism the Red Card’ is a fantastic charity and the message that they bring is vital to the future generation, I strongly believe this charity is a major factor in how the children of the future behave when it comes to racism as many of the children I've worked with across these few days are still unsure on terminology and also not to judge people before getting to know them. Overall I have had an amazing week with the charity doing my work experience and I’ve enjoyed myself the whole way through learning about the history of the charity and where it all began but also racism itself as I got to learn many different things with Kris about the history of slavery and the many stories about Shaka Hislop which I found very intriguing. I strongly feel that this week has been a major success for me as an individual and I have enjoyed working with everyone from start to finish!